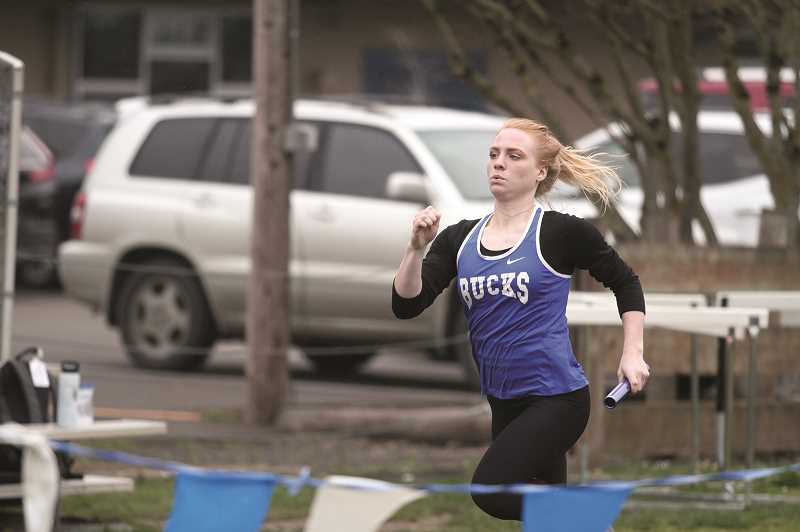 The St. Paul track and field team hosted its annual Buckaroo Round-Up on Thursday, with the boys and girls each finishing runner up in the team standings. Led by the team's stable of runners, the St. Paul girls scored 66.83 points and barely missed out on a first place finish after being edged out by Southwest Christian with 68 points. The Buckaroo girls took first in five events, all on the track, paced by sprinters Rachel Vela and Isabelle Wyss. A senior, Vela led the field in the 100-meter dash with a season-best time of 13.64. Wyss, a junior, likewise took first in the 200 with a season-best time of 27.74, followed just behind by Vela, who set a personal record in the event with a finish in 27.94. Vela and Wyss teamed up with Taysha Veeman and Sadie Smith to win the 4x400 with a time of 4:29.67 by a comfortable margin of nearly 10 seconds over Southwest Christian. In the short relay, things were much closer, with the Bucks finishing in 54.63 to win by less than a second over the team from Falls City. The St. Paul girls' final win came in the distance events, where senior Emma Connor scored her first victory of the season in the 3,000 with a time of 12:33.70. The boys team was equally as effective in the relays, winning both events as well. Gianna Grasso, Adam Cook, Francisco Vargas-Ayala and Jaden Thompson took the win in the 4x100 with a time of 45.83 that beat out Lowell's team by half a second. Wyatt Bean tagged out Cook in the 4x400 relay, and the Bucks went on to win by a nearly 20-second margin with a time of 3:45.40. Grasso scored another victory individually when he led the field in the 200 with a PR-time of 23.34, while Haden Thompson gave the Bucks their final victory in the high jump with a season-best height of 5-04. The Gervais girls placed second at the Cougars' first league match of the season, hosted at Colton High School on April 4. Sophomores Mary Davidson and Katie Hanson racked up six victories between the two of them to lead the Cougars, followed by a pair of top-three finishes in the mid-distance events for fellow sophomore Judith Santos. Davidson led the field in both the 100 (13.90) and the 200 (30.20) in addition to taking home a victory in the shot put (28-04). Meanwhile, Hanson led the way in the 400 with a PR-time of 1:01.40, and added a second PR in the long jump with a distance of 15-04. She added a third PR in the triple jump with a mark of 32-06, and came away with the win there as well, though she was the lone competitor in the event. Santos picked up a pair of PRs in her events, placing second in the 1,500 with a finish in 6:45.70 and third in the 800 at 3:07.80. The boys team finished last in the standings, but had several standout performances. Sophomore Brian Limage led the field in the 400 with a PR-time of 53.74, notching the first victory of his track and field career. Junior teammate Noel Trevino added a first-place finish in the 110-hurdles, setting a personal-best time of 20.00. He added a second-place finish in the 300 hurdles with another PR of 52.30. The North Marion girls golf team placed fourth overall at the Meriwether Golf Club on April 2, led Alana Walls' team-best score of 115. Raymee Boese (119), Mallory Patzer (130), Samantha Simon (137) and Vivian McCollough (145) combined to give the Huskies a final score of 501, placing above Country Christian (544) and below Valley Catholic (380), Astoria (425), and Molalla (478). The boys team traveled to Astoria on Thursday and were led by Colby Shorter's score of 91. Owen Arnett (99), Calvin Sahlin (103), Carson Hubbard (105) and Jacob Temple (113) rounded out the varsity team, which finished the match with a score of 398.